I just love it when someone asks me to do something I've never done before. My client's daughter is having a rainbow/tie-dyed theme party. She asked if I could make a "tie-dyed" cake... Here's the teaser.... batter in the pan! 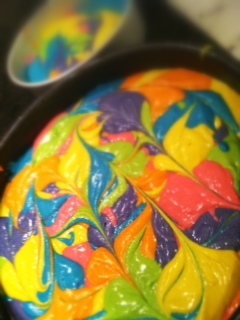 I dolloped the batter by spoonfuls throughout the pans trying to somewhat evenly distribute the colors. When I was finished, I tapped the pan on the counter to make it "settle" into an even layer... then I took a small knife and zig-zagged it through the batter.... first up and down.... then left and right. Not too much! I think it would have made the colors muddled. Can't wait to get a picture of it being sliced into!